Tuesday Tip: Picky eaters? Mix it up and make lunch the new dinner! Does this picture look familiar? With five kids who are now seven, five and three (times three! ), this is a look I see all too often. Like three times a day. Breakfast, lunch and dinner. Times five kids. That’s ten eyeballs rolling to the skies with pretty much every plate we ever place in front of them. Needless to say, none of these ploys work. And, my frustration is growing in direct proportion to our growing grocery bills. I just can’t stand — can NOT stand! — throwing food away. We work hard for our money; we work hard to provide healthy, well balanced meals. And, if that’s not enough to persuade our persnickety half-pints, there truly are starving children all around the world — and, for that matter, close to home as well. You know what these things are? Dinner! Not every night, of course but, these are my lazy working mom’s go-to weeknight standbys. I panicked. If I give the kids mac and cheese for lunch, what will I do for dinner?! And then it hit me. Sandwiches! Yogurt! Cheese Sticks! Apple slices! Carrots sticks! And all the other yummy, healthy things that I pack for lunch and unpack at the end of the day. Yes my friends, that is the solution. A weapon in your arsenal against picky eaters: Make lunch the new dinner and vice versa! It works! From a kid perspective, it is fun and novel and new — and that is half the battle. We’ve long enjoyed “breakast for dinner” on busy nights when the fridge can’t cough up more than a few eggs and english muffins but, the notion of “lunch for dinner” or better yet, “dinner for lunch” hadn’t occurred to me. Until now. And so far, it’s working like a charm. As for the old line about hungry kids around the world, well, we can’t help them all but we sure hope to help some. This fall we’re going to bake brownies for a local shelter and deliver food baskets for Thanksgiving. I’d like to think that we’re doing our (admittedly small) part in stamping out hunger and, selfishly, I will sleep better knowing that my own kids won’t be “starving” in their school cafeteria. 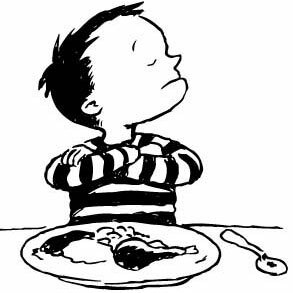 Do you have any tips for picky eaters? Please share — before the novelty of this one wears off for our brood!